Blind Pass A202: Amazing West End Location Only Steps to Shelling & Sunsets!! For all other arrival and departure days, or for reservations less than 3 days, please call our reservation specialist at (239) 579-0348 or submit your inquiry below the calendar. 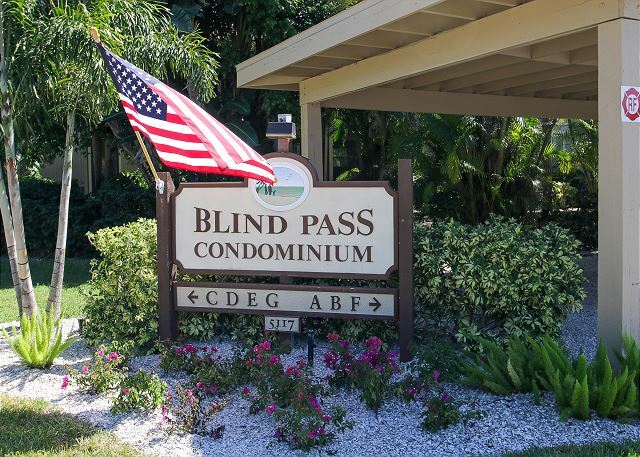 A lovely 2 bedroom, 2 bathroom unit at Blind Pass Condominiums close to Bowman's Beach! 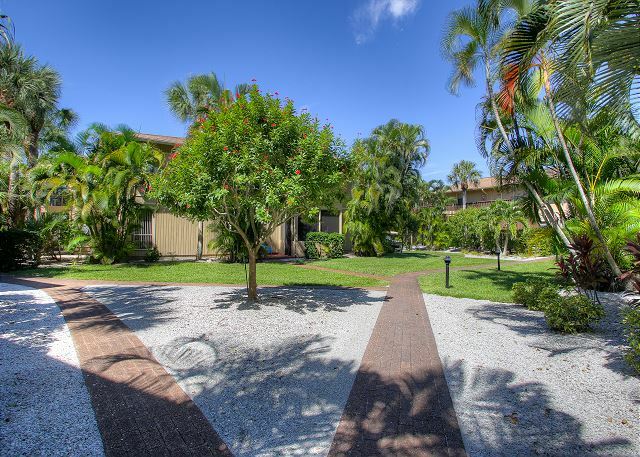 Relax and unwind in this spacious and bright two bedroom, two bath, well appointed condo decorated in a tropical Sanibel style. The large, original wall mural will remind you of the beautiful Florida birds and unique water scenes that you will experience during your visit. 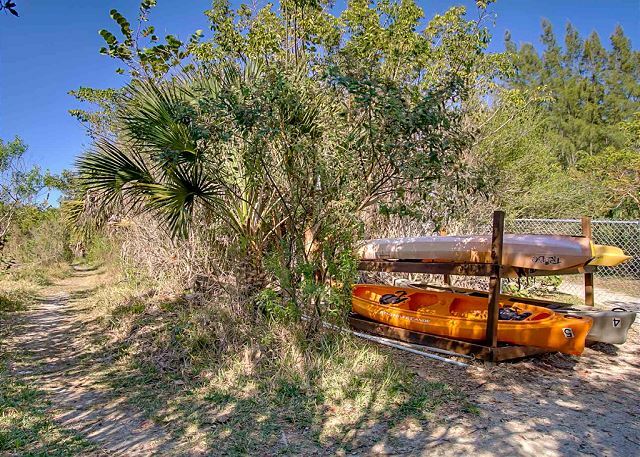 The condo location is unique with a private path to Bowman's Beach and a foot bridge over Clam Bayou. As you stroll to the beach be on the lookout for osprey, heron, and pelican, as well as pinfish, crabs and live shells crawling in the Bayou. Be sure to plan a canoe or kayak trip throughout the Bayou and watch the wonders of nature unfold. The nearby white sandy beach is ideal for shelling, long walks, fishing, and the 'Key West' style sunsets. Take your chair, drinks & snacks and just sit back and enjoy. 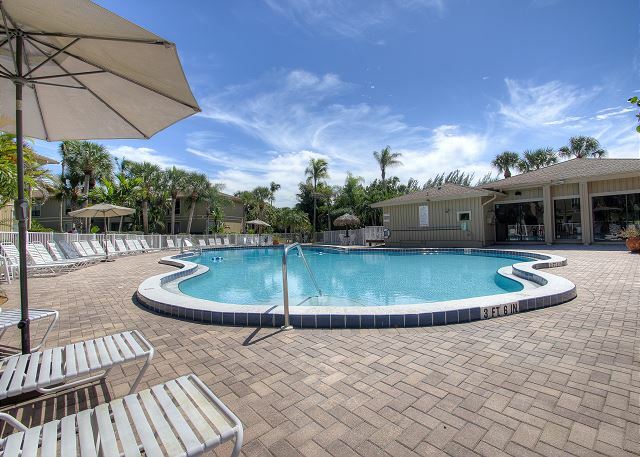 The beautiful pool, tennis courts, swaying palm trees, warm tropical breezes and lush tropical plantings will remind you that you are vacationing in Paradise! Condo amenities include: 2 bedrooms/2 bathrooms -- 1 King bed, 2 twin beds, and a pull out Queen sleeper sofa bed (sleeps 6), 2 TVs & DVD player, free WIFI & cable, heated shared pool, in suite washer & dryer, public BBQ gas grills, tennis courts, complimentary canoe & kayak use through complex. Bed linens and Bath towels included. No Pets allowed. This unit is non-smoking with a maximum occupancy of 6 people. This unit comes stocked with beach chairs, beach towels and an umbrella. Guest Reviews of blind pass a202: amazing west end location only steps to shelling & sunsets!! Great experience. Biking every day and nice times shelling on Bowman Beach. Facilities were great. Quiet compared to places we have stayed in St. Petes. Would definitely come again. Thank you so much for your review of Blind Pass A202! We are so happy you enjoyed the beach and the seclusion that Blind Pass offers. We hope to see you again next year! We love staying at Blind Pass and had a great time. Overall experience was great and renting through SBl couldn’t have been more convenient. Thank you so much for your review! We are so glad you enjoyed your stay at Blind Pass A202! 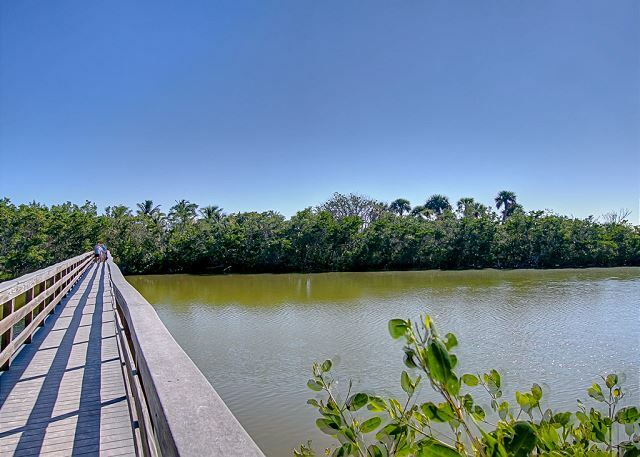 We hope next time you are planning a trip to Sanibel, we can help with another great trip! We really liked our condo. If we are pickie then I would like temperpedic foam on the too hard mattress. The condo was too far from parking and a long way to take groceries, suitcases, etc. Are there elevators in the three story condos? We have to decide what to do next year in six months. Hi Allen! We are so glad that you enjoyed the condo. I can send you over options for next year's trip to Sanibel that might work a little better for you! We are happy to help with making next years trip more convenient for you! This, our fifth visit to Blind Pass but our first stay in this unit, was probably our most enjoyable. The unit was clean and comfortable. Our only suggestion would be an update of appliances, especially noisy refrigerator and dishwasher. Thank you so much for your review of Blind Pass A202! We are so glad you enjoyed your stay with us! It is so nice to hear that you have enjoyed Blind Pass through the years and appreciate that this was one of your best trips! We hope to help you plan another trip in the future! The condo was well kept, and clean. It was a blessing to be able to walk to the beach every day, since parking on the island is limited. Having chairs, umbrella, shovels, pails, etc was also very nice. The pool was amazing, warm and big enough to handle a crowd. Quiet area on the island. It was GREAT! Thank you so much for your review of Blind Pass A202! It was a pleasure working with you and we are so glad you enjoyed your stay! We hope to help you plan another trip to Sanibel in the future! Fantastic location and comfortable stay! What a perfect location. We love Bowmans Beach. It was just myself and my other half but we couldn't help to think how perfect it would be for family with the 2 separate bedrooms, bath, kitchen, laundry, etc. 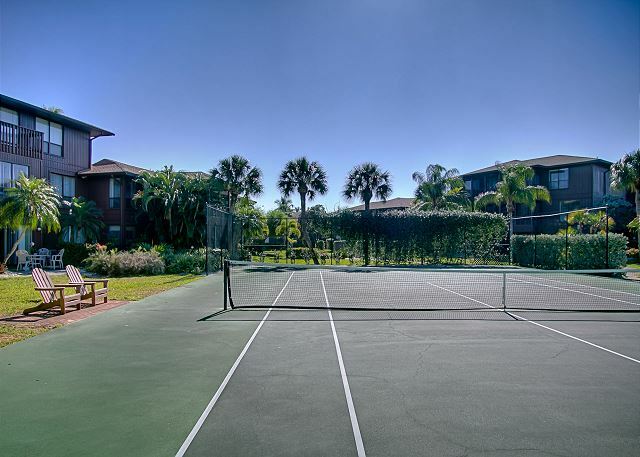 All the amenities are there including a pool and tennis courts, kayaks.. Plenty of beach gear, carts, towels, buckets for shells, you get the idea. When you first pull in it looks like it is a long walk to the beach, but it's very close and a short walk through through the complex. The condo itself is on the second floor. We found it to be very quiet and accomadating. The Sanibel Vacations Staff were great. Just a phone call away and ready to help with anything you need. My only complaint is that 3 days is not enough!! Oh, just be sure to bring everything you need for the kitchen food and drink wise. Thank you so much for your review! We are so glad you enjoyed your stay at Blind Pass A202! We would love to help you plan a long stay in the future! Thank you so much for your review! We are so glad you enjoyed your stay! We hope next time you are planning a vacation to Sanibel, you will contact us! It was nice. The beds and pillows were not very comfortable. I liked all the beach items supplied - cart, umbrella, etc. Having to wash the beach towels ourselves seemed odd. Thank you for taking the time to leave this review! We would have been happy to bring new pillows out to you! Please let us know if we can help you plan another vacation to Sanibel! Thank you so much for your review! We are so glad you enjoyed your stay! We hope to see you on Sanibel again soon! Loved everything about the rental. But, I felt like they could be a little more generous with trash bags, toilet paper, and dish washer soap. Thank you so much for your review! We are so glad you enjoyed your stay! I will definitely pass that suggestion along! We hope to see you again soon. Plenty of thoughtful touches were found in this unit including shelling equipment and good equipment for cooking. Overall, the complex is nice and has its own private beach. Management and maintenance were professional and cheerful. The only thing I’d suggest is that it’s time to replace the bed linens and blankets, as they appeared to have seen their better days. Thank you so much for your review! We are so glad you enjoyed your stay! We will definitely pass this along for future renters! We hope to see you again soon! Thank you so much for your review! We are so happy you enjoyed your stay! We had a wonderful vacation. The property was nice and quiet and very clean. I had trouble getting the tv to work,made a call and someone returned my call within 30 minutes. The only issue we had was the walk to the beach ,which I loved, but my mother is in her 80's so it was difficult for her. She was very happy by the pool though. We are so happy you enjoyed your stay on Sanibel! We hope you will stay with us again in the future! Thank you for your feedback! The unit was as described. Clean and well equipped and comfortable. The area was quiet with uncrowded beaches about midway between Sanibel town and Captiva. Overall we had a very pleasant 2 weeks. Thank you so much for taking the time to review our condo! We are so happy to hear you enjoyed your stay. Please stay with us again when visiting Sanibel! The condo was clean and very roomy I go to Sanibel yearly in November to volunteer at the Crow Taste of the Island The walk to the beach everyday was wonderful and the weather was great. Everything was perfect. Mr. Kerwood, thank you so much for your review! We are so happy you enjoyed your stay! We hope when you come again next year for the Taste of the Island, you will stay with us again! Our favorite time was walking through the Complex out to the Gulf to watch the sunset, and play in the surf with my daughters. Quiet part of Sanibel Island with great access to Bowman Beach (wonderful for a beach run) and Ding Darling Wildlife Refuge. The condo was clean and comfortable. Thank you so much for your review Mr. Lemmons! We are so happy you enjoyed your stay with us. We hope when visiting Sanibel Island again, you will book with us! It was a new place on the island, for us, and we were very pleased with the condo. We are looking forward to bringing our whole family back next time. We are so glad you was pleased with the us and we look forward to your future stay with us! The condo was well-located, a short walk from Bowman's Beach (although it does not overlook the beach). It was a very nice place to stay for a family with a toddler. When we arrived there were some minor issues with the condo (shower door off the rail, internet not working) but the property management company responded immediately and fixed the problems. I would certainly recommend this place! Mr. Hilt, thank you so much for spending your vacation with us. We are very pleased that we could make the most of your stay!... See you again Soon! Loved the place!!! Working with the staff was great. They promptly answered any questions I had and made our stay very enjoyable. I have stayed at many places on Sanibel Island but this was the best! We strive hard to make things a perfect as they can be. As you mention, it starts with us exceeding those expectations. Very nice condo overall. Clean and neat. Plenty of cooking supplies and beach items too. However, all of the beds were pretty hard. Also we were informed upon arrival that previous guests informed rental company that guest shower door was not on track correctly and they would be out to fix that. No one ever fixed it in the two weeks we were there.Nice, clean condo overall. We are glad you stayed with us. And sorry to hear about that shower door. Not sure if the guest did mention it or not. I couldn't find anything on record. We hope that doesn't effect you staying with us again. A chance to make it right! Our first family vacation with our 2 year old was perfection!!! The unit had everything we needed including 2 rocking chairs which helped with a fussy toddler at night!!! We were able to make a quixk phone call to rent a crib which saved us greatly!!!! The staff at sanibel vacations made the process of setting eberything up so easy!!!!!! They were instantly like part of the family!!! I have stayed at blind pass several times growing up and a202 by far was the best location!!! So quiet and peaceful!! The screened in porch was magical!!!! You can see sun come up and go down!!! We loved everyrhing and it was very hard to leave paradise!!! I didnt think a vacation with a toddler could go so smoothly - and this vaction exceeded my every expectation!!!! We are so glad this first family vacation went well without any major hiccups. We loved seeing your family and the smiles on your faces. We look forward in seeing you guys again next year! We had 3 generations, age 9 to 74. Had enough to do for everybody. Beautiful weather. Loved the tennis courts where we played pickleball. The pool was beautiful. Short walk to the beach. What's not to like? The apt was clean, well provisioned with cook ware, linens, towels, beach toys. 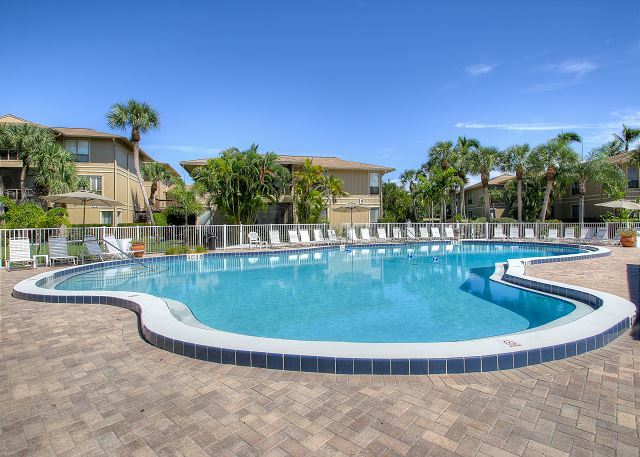 Excellent location, nicely furnished and well equipped condo, great place for a lovely Florida vacation. We hope to return! Awesome! We will see you next year! Property description and photos were right on. Very comfortable for two couples. Access to the beach a big plus. Bowman's Beach location is quite. The Condo also was quite and guests friendly at poolside. Only left the Island twice in two weeks. Plenty to do. Toured Ding Darling twice, at high tide and low tide. I would return! Beautiful condo, comfortable beds, wonderful place to eat meals on the lanai. We had a rough start: impossible to get a taxi on Sanibel on a Sunday (you have to reserve in advance), so no way to go get our rental car at Hertz and to do groceries! Rob from Sanibel Vacations saved our day; he came to get us and drove us to the garage and gave us a lot off tips. He was wonderful, we are so grateful. The rest of the week was paradise. My only suggestion for the condo is to reduce the number of fake flowers because they collect dust and I'm allergic.Also, this is not a place to arrive at 1 AM as we did (our plane was delayed). First we had a hard time with the lock to obtain the key to the unit, then, when we arrived during the night and all was dark, we had a hard time finding the unit and the front door! The units are in a horseshoe shape and entrances are inside the horseshoe. After all these initial challenges, we had a wonderful time!! The place was wonderful, comfortable and fully stocked. We especially appreciated the cart and beach items. My father was along (95) and it was a walk to get from the parking and up the stairs for him. SBL was very helpful when we needed it. Lots of light, enjoyed sitting in the screened in lanai, would definitely recommend. We have rented this condo for many years while it was under different property managers. Sanibel Vacations made the stay(s) even better by providing convenience, additional services, and readily available customer service. The location of the condo is perfect for beach access as well as other attractions on the island. It is, in my mind, a mid island location as it is about the same distance to Captiva and the center of Sanibel. Hi Mr. Lopez, we are so sorry about the issues during your stay and we and the owners are making necessary steps to correct this. We hope you will stay with us again in the future. The unit is very comfortable and attractive, which is why we have been coming back for years. We enjoyed a relaxing week in this lovely condo. We particularly enjoyed our proximity to the Darling National Wildlife Refuge, other conservation trails, and the beach. This is a great place for birdwatchers and nature-lovers! we needed a place to stay while we came to look for shells this unit was a great place.good location between light house and Captivia lots of beach and kitchen toys. Thank you, Frank! So happy to hear you enjoyed your stay and it was a pleasure having you! Come back and see us soon in order to add to your shell collection! This condo is amazing. Everything you could ever want in one place.. Clean and beautiful. We have been staying in the same condo for 11 years. We will continue as it is our home away from home! Comfy place to stay with great beach location. Shelling was wonderful. Pool was too hot for my taste but we enjoyed the tennis courts. We stayed in Betty and Jim's condo two years ago and couldn't wait to get back! The place was even better than we remembered. For four weeks we felt like we were home. The folks at SBL were very friendly and helpful and we would highly recommend them. We are already looking forward to another visit on the island. Thank you so much for your review! We are so glad you enjoyed your time. It is a pleasure having you! We loved staying here at Blind Pass on Sanibel. The condo complex is beautifully landscaped, providing privacy to porches by planting trees and shrubs. It is a 5 minute lovely walk to the beach, by bridge across a lagoon where jumping fish are frequently seen, then a sandy path to the beach. This unit has lots of beach accessories, including a useful wagon for carting everything. The unit is on the 2nd floor, which is good for views of tops of trees, and for privacy, but lots of steps to climb to get to it. The condo is close to Captiva - a good bike ride. The unit we stayed in is very clean, nicely furnished, excellently maintained, with a screened-in porch overlooking trees and flowering bushes - a wonderful week spent there. My favorite restaurants are Timbers, Doc Ford's, and Jacaranda - pizza is fabulous at The Great White (Shark). I always love going into Tower Gallery where the local artists display and sell their work. I would recommend highly this condo to anyone! Beds were good, all beach necessities on hand. Short (private) walk to beach full of bird and critter watching opportunities. Thank you Barbara, we appreciate your comments and hope to see you again in the future! We had a wonderful stay in this condo. It was clean, quiet and had everything we needed. There were beach toys, a beach cart, noodles, etc. and we loved being on the quiet side of the island We would definitely rent again! Our family stayed here for a week in January, 2016, and we had a great experience. Rob at Sanibel Vacations (the property manager) was very helpful and friendly. The condo was as advertised, as was the condo complex (Blind Pass) and all the amenities. We enjoyed the pool, the free kayaks and canoes available to borrow at the condo, and the short (5-10 minute) walk to the beautiful beach. Our kids loved looking for shells, and they were all over the beach and very easy to find.The people at the club house were very helpful and able to answer our questions and give us suggestions about things to do on the island. We would also recommend the shell museum, we loved learning all about the shells and then going to try to find them on the beach. We also rented bikes one day and had a great day biking around the Island, including the Ding Darling Wildlife refuge.The only downside when we went was the weather, which of course has nothing to do with the condo. It was in the 50's and 60's most days (a few days hit 70 degrees), and it rained pretty hard a few days. I don't know if this is common for Sanibel in January, but it made for some cold swims and walks on the beach. So just check out the average weather before you book and know what to expect. The clubhouse has some kids DVDs and some puzzles (500 - 1000 piece ones, good for older kids and adults) so we enjoyed those on the colder days. There are also quite a few books both in the condo and the clubhouse. I would definitely recommend this condo to my friends. We thoroughly enjoyed our stay on Sanibel. Couldn't have asked for better weather. Saw two manatee under the bridge going out to the beach along with the alligator. Condo was very clean and rental agency was helpful and promptly responded to questions/needs. Would stay again.